Our insurance is with ATIG, which is specific to the repossession industry and provides comprehensive coverage for protection of your valuable collateral. This insurance covers your collateral while it is being driven, towed or stored providing comprehensive coverage that encompasses a variety of circumstances. 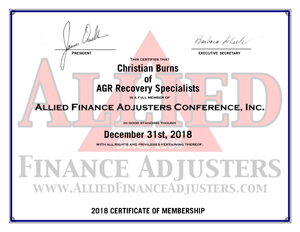 AGR Recovery Specialists are members of Allied Finance Adjusters. This national trade association is dedicated to the advancement and continuing education of the repossession industry. We are properly licensed, fully insured, and covered by the Allied Client Protection Bond of $ 1,000,000.00. We are also members of FLACARS. The association was created to advocate for the rights of licensed collateral recovery specialists. FLACARS officers/members work diligently for the elimination of unlicensed, unprofessional and/or uninsured asset and collateral recovery practices. Each person employed by AGR Recovery Specialists has completed the Certified Asset Recovery Specialists training program through C.A.R.S. This program provides a professional training curriculum for the collateral recovery industry. The course covers Asset Recovery, Skip Tracing, Ethics and Communication, Defensive Driving and Tow Truck Operation, as well as Insurance Coverage. Vendor Transparency Solutions conducts detailed screening of suppliers to provide insight into their background, integrity and financial standing. VTS screens all asset recovery agencies, forwarding companies, skip trace agencies and transportation companies. The screening includes a detailed inspection of every office and storage facility that the agency utilizes to operate their business, a comprehensive on-site compliance inspection, background checks on all employees, verification of all corporate documents, verification of all educational certifications, lawsuits, bankruptcies, operational manuals, verification of all reported equipment and verification of proper insurance and bond coverage. Membership into RISC C.A.N. is reserved for those professional practitioners who meet the standards as specified in the Compliant Agent Network code of ethics and who pass the vetting process. All necessary compliance documents are within the member dashboard area. We can also utilize the RISC Compliance and Operations Manual which is designed to assist in all areas of CFPB compliance.